Three-year-old hero Teague Whalley saved one of the most endangered sea turtles in the world from certain death on Monday, November 29th. 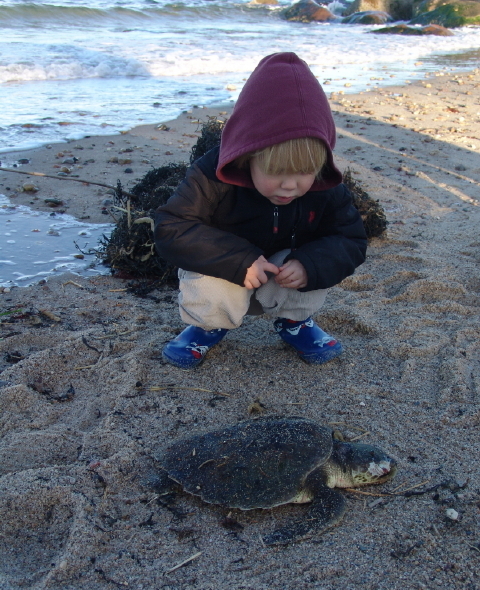 Teague proves the rule that you’re never too young to begin saving the world, one turtle at a time. 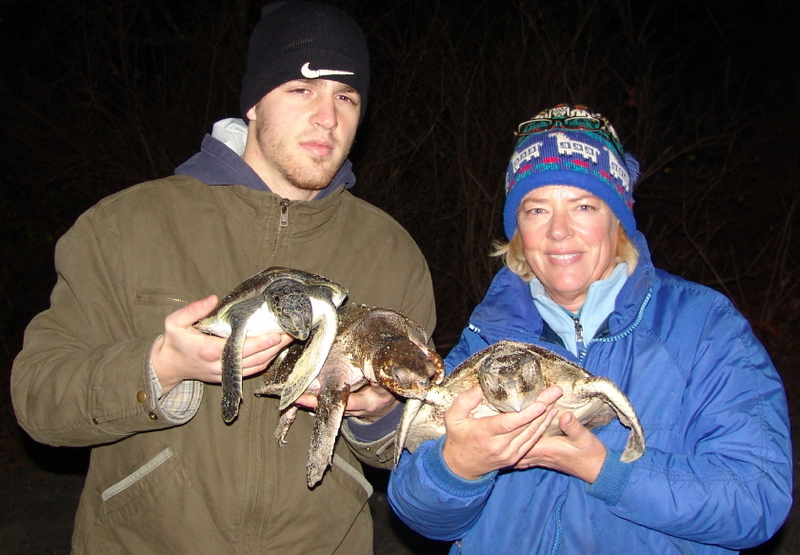 Turtle Journal salutes Teague and his mother Karen Whalley for their successful efforts to save this badly injured, and cold-stunned Kemp’s ridley sea turtle. 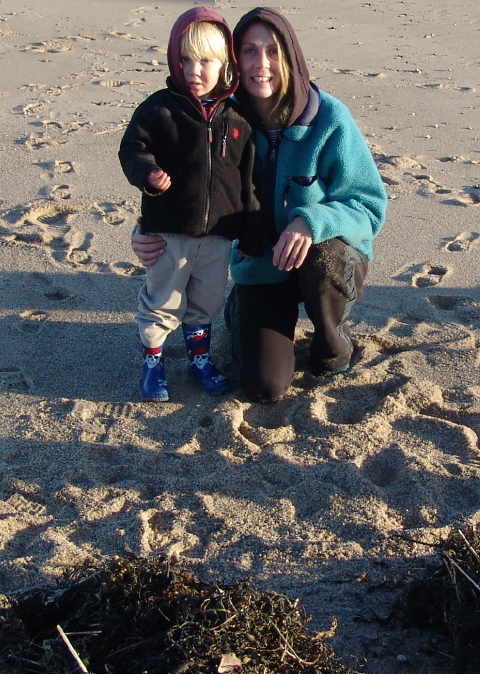 Late Monday morning, Karen Whalley and her son Teague walked Sagamore Beach on a beautiful sunny day. The seas were calm and the winds gentle. The tide had receded, allowing Karen and Teague to explore the shoreline. 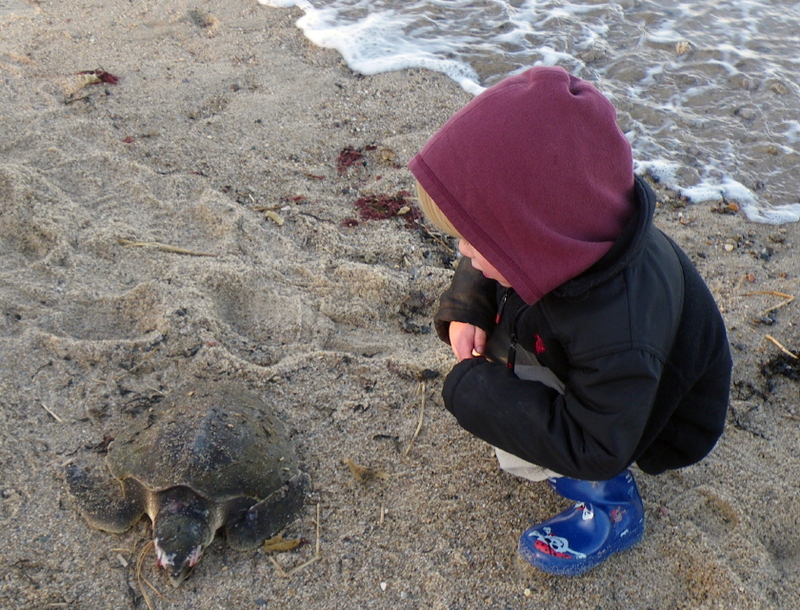 As they approached a rock groin (the distant one pictured above), Teague and his mom found a “beautiful” sea turtle unlike anything they had ever seen on the beach before. Not knowing what to do, they returned to their nearby home and searched the internet to find a Cape Cod sea turtle rescuer to call. Unsurprisingly, Google search produced the hotline number for Turtle Journal (508-274-5108). They also found the procedures for saving a stranded sea turtle. After calling Turtle Journal, Karen and Teague rushed back to the beach. The tide was rising quickly, and they had to plunge into the water to rescue the turtle before it was dragged out to sea and condemned to certain death. As they lifted the turtle to the beach, it began to move its flippers, signaling that it was quite alive. Karen and Teague covered the sea turtle with dry seaweed to prevent hypothermia while they waited for the Turtle Journal rescue team to arrive. While Turtle Journal’s Sue Wieber Nourse documented the rescue with photographs, Don Lewis examined this juvenile, 2-year-old Kemp’s ridley. Its right eye had been damaged either by scraping against the rocks as it was driven ashore or by predatory gulls. But this little critter proved a survivor and demonstrated its fight for life by trying to “swim” out of my arms. It was late in the afternoon, but we knew that this animal would not survive the night unless it received immediate medical attention. We called the New England Aquarium marine rescue hotline and explained the situation. While they are swamped with nearly a hundred cold-stunned turtles already, and rarely accept new animals this late in the day, they generously agreed to accept this Kemp’s ridley. Sue Wieber Nourse and I raced up Route 3 to the new marine rescue facility in Quincy, and the turtle was admitted to the emergency facility by 4:15. But none of this would have been possible if it were not for a heroic young lad, Teague Whalley, and his mom Karen. Quicker than you can say, “A. 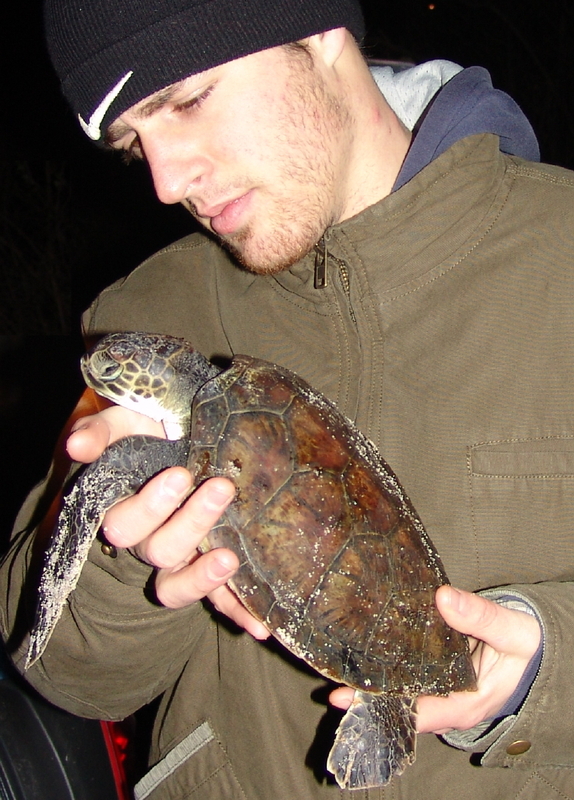 P.,” our photograph of Turtle Journal’s Jared Nourse holding the tiny green sea turtle he rescued from Breakwater beach in Brewster at 3 am on Thanksgiving morning went hyper-viral through the global electronic community. We received a call late Friday morning from A.P. Boston to confirm that the photograph was ours and that we were willing to allow it to be distributed by A.P. 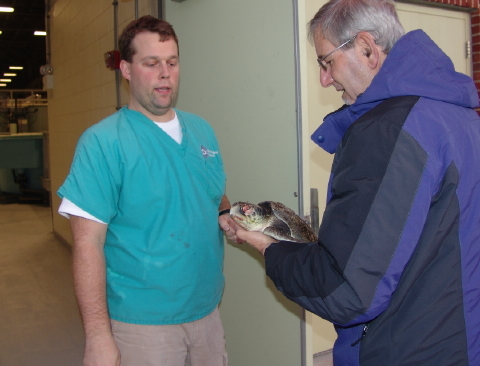 to underscore the story of cold-stunned sea turtle rescues on Cape Cod. Much less than an hour after that conversation, our computers began to buzz with hits as the image started appearing in on-line newspapers and media outlets, first locally, then regionally, and swiftly moving across the country and around the globe. Cape Cod, Boston, Springfield, Worcester, New Haven, Nashua, Albany, Buffalo, Philadelphia, Gettysburg, Washington D.C., South Carolina, Miami, Georgia, Texas, St. Louis, Ohio, Illinois, Wisconsin, Montana, Idaho, Arizona, California, Oregon, Seattle, Anchorage, Hawaii, Samoa, Manila, India and even the Himalayan Times in Nepal. In between, other media picked up the photograph, including CBS, ABC, Fox, Cox Cable, Time Warner, Comcast, and so on and so forth. It’s a breathtaking, mind-boggling experience to behold as one of your creations goes viral. It feels a bit like letting your puppy slip outside to gnaw on a bone, only to get a call a few minutes later from the Dali Lama complaining that your dog was tugging at his alarm gong. One good piece of news is that Jared has not let the incident go to his head, although he does assert that his hand-modeling fees will be substantially increased for future gigs. A cold front plowed through the Mid West and stormed into New England for the Thanksgiving holiday. Northwest winds swept across Cape Cod Bay, driving thunderous surf onto beaches from Barnstable to Truro, and tossing helpless cold-stunned sea turtles onto the shore. These tropical and semi-tropical sea turtles that were trapped in Cape Cod Bay by plunging ocean temperatures became cold-stunned and entered stupor as the sea water thermometer dropped into the low 50s. Like flotsam and jetsam, they get bounced around the bay until powerful weather conditions and high tides push them ashore. Then, if rescuers can be on the beach to discover them before fatal hypothermia sets in, these turtles have a good chance of returning safely to the wild where they will restore declining populations. High tide came at 1:30 am and the NW wind direction indicated that likely beaches would include East Dennis, Brewster, Orleans, Eastham and Wellfleet. 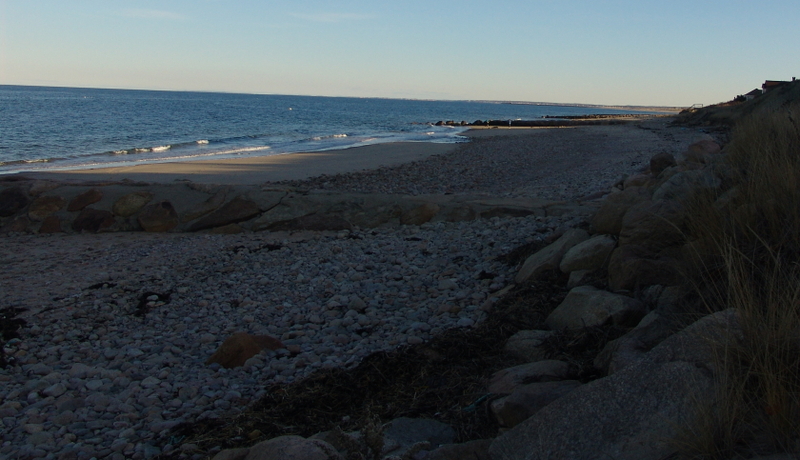 The Turtle Journal team drew Brewster beaches from Paine’s Creek (near the Cape Cod Museum of Natural History) through Point of Rocks. With a westerly component in the wind, the objective is to walk from west to east, keeping the wind at your back rather than in your face. We reached Paine’s Creek a little after 1:30 am. Sue Wieber Nourse and Jared Nourse took the first leg of the patrol from Paine’s Creek to Breakwater; Don Lewis had the easterly leg from Breakwater to Point of Rocks. Sue Wieber Nourse spotted the first turtle, a medium sized juvenile Kemp’s ridley about a 1/4 mile east of Paine’s Creek. Jared discovered a smaller Kemp’s ridley about a 1/4 mile west of Saints Landing and a tiny green sea turtle west of the Breakwater seawall. While Kemp’s ridleys are the more endangered species, it is always a special event to recover a small green sea turtle from the surf. Here on Cape Cod, greens are relatively rare, perhaps two or three percent of all cold-stunned sea turtles. So, the rarity of finding one makes them special. 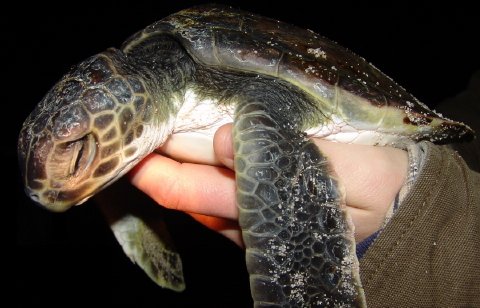 They’re also arguably the most beautiful sea turtle, even when in cold-stunned stupor. Unlike Kemp’s ridleys and loggerheads, their carapace (top shell) always seems highly polished and free of algae. When opened, their big puppy-like eyes add a certain cuteness factor. 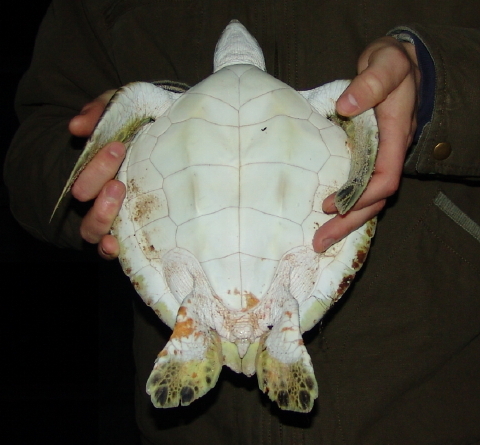 Even their plastron (bottom shell) seems creamy white and shows very little algae build-up. All in all, a very beautiful creature! This specimen measured only 23 centimters (9 inches) from the leading edge to the trailing edge of its shell. One of the Kemp’s ridleys was fairly small, while the second was a bit larger. Because these animals are helpless in the sea, they tend to be blown ashore by physics rather than biology; that is, by size with the smaller first. 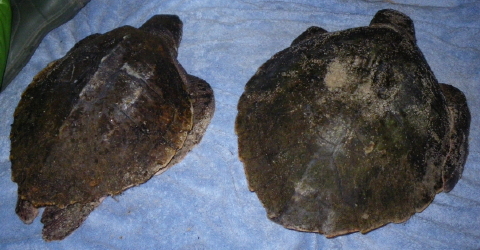 As strandings progress, larger and larger animals predominate until near the end of the stranding season, when massive loggerheads rule the beach. 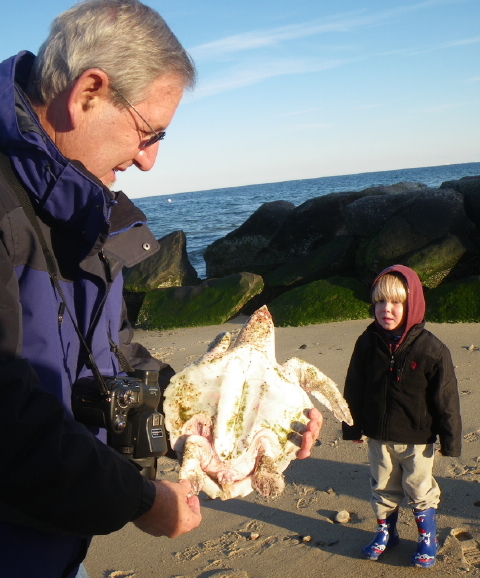 More turtles were discovered on Thanksgiving Day as holiday visitors walked the beaches. The winds have subsided now and whether or not we launch middle of the night patrols again this evening will depend on what the midday tide yields. “Horseshoe crabs are evolutionary survivors that have remained relatively unchanged in appearance for 350 million years,” begins the U.S. 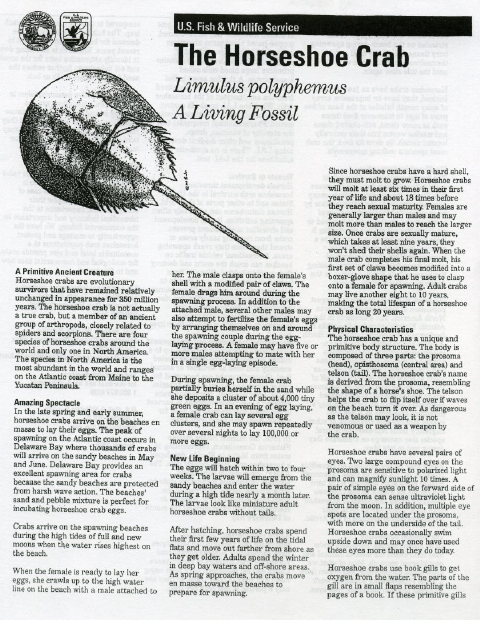 Fish and Wildlife Service information fact sheet on “The Horseshoe Crab (Limulus polyphemus) — A Living Fossil.” As youngsters summering on Cape Cod, the Turtle Journal team remembers swarms of thousands of mating horseshoe crabs on beaches from Falmouth to Provincetown. Wading in the tidal flats was transformed into an obstacle course as we stepped over myriad pairs of horseshoe crabs approaching the beach. Today, populations have dwindled by orders of magnitude as these gentle critters have been harvested for conch and whelk bait, have been bled for medical research, and have been hunted and killed for bounties. 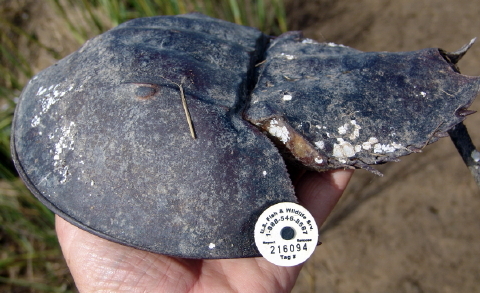 These inter-tidal roto-tillers provide a critical service for the estuarine ecosystem, and as you will learn in the fact sheets below, horseshoe crab eggs are a critical factor in some of the longest shorebird migrations on record. 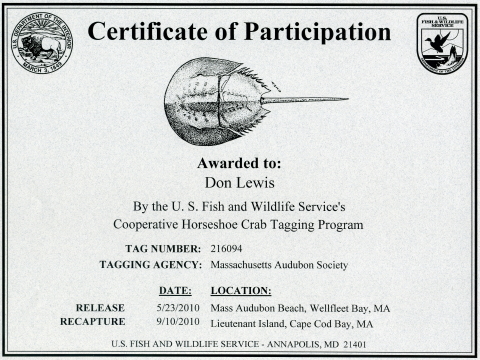 Turtle Journal’s Don Lewis discovered the tagged horseshoe crab in the salt marsh off Lieutenant Island. He photographed the animal and the tag, and later called the toll free number of this U.S. Fish and Wildlife Service research project. We received a nice letter from the U.S. 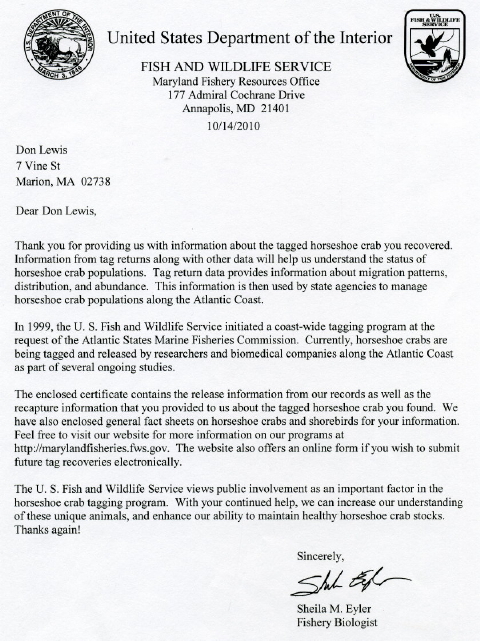 Fish and Wildlife Service to give us more information about the tagging program and to thank us for our participation. 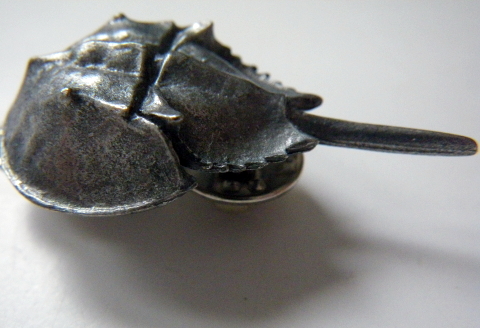 Included with the letter was a wonderful horseshoe crab pin that captures the very essence of this ancient critter in miniature. We will wear it with pride. 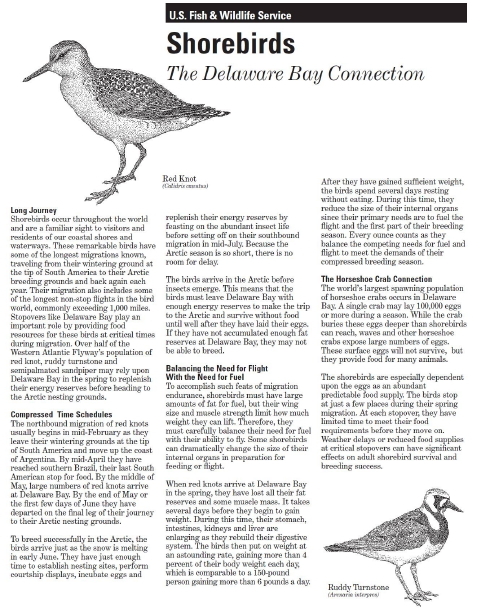 … and a background paper on shorebirds that depend on horseshoe crab eggs. Turtle Journal encourages you, too, to participate in these worthwhile research programs. 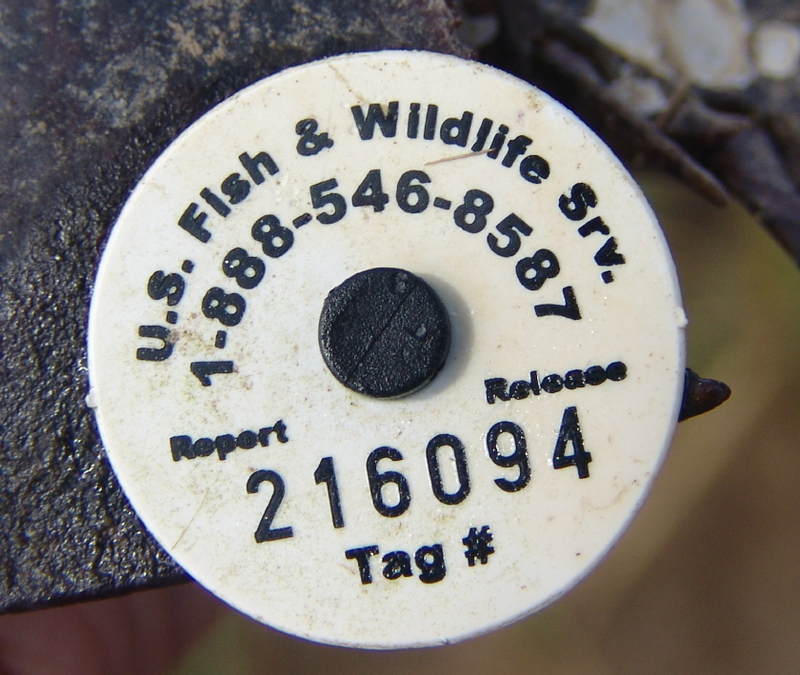 Whenever you find a tag in the wild, record the tag number, make a note of the telephone number, remember the location, and give U.S. Fish and Wildlife a call. In our hearts and memories, horseshoe crabs are a quintessential Cape Cod symbol. And, between turtles at 300 million years old and horseshoe crabs at 350 million years old, we are fortunate to study living fossils that may actually have something important to teach their big brained yet less capable successors about LONG term survival. Turtle Journal received a sea turtle report from our colleagues in Southwest Florida this weekend, and we’re excited to share this good news durng a year that has witnessed unrelenting bad news about the Gulf environment and sea turtles. We thank our friend, Ranger Randy Sarton of the Ritz Carlton in Naples, for thinking about his chilly turtle comrades up here in the Great White North as we patrol Cape Cod’s frigid beaches for sea turtles during our fall-winter stranding season. Speaking of cold-stunning, Turtle Journal remembers that only last winter (2010), thousands of Florida sea turtles were caught in a miserable cold snap that sent them into hyp0thermic stupor. This event called on naturalists, environmentalists, conservationists, scientists, researchers and willing volunteers to find these precious animals tossed randomly along Florida’s wide-spread gulf and ocean beaches. 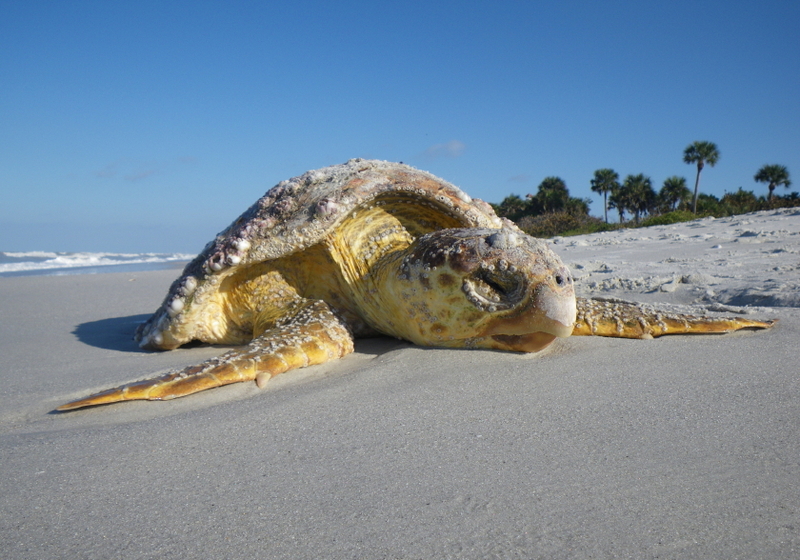 In fact, Turtle Journal’s Sue Wieber Nourse contributed her share when she discovered this cold-stunned loggerhead sea turtle on Vanderbilt Beach in Naples, Florida in February 2010. Of course we all remember that the Gulf Coast experienced an unprecedented ecological tragedy with the drilling platform explosion and leak this past year. The effects of this disaster on sea turtle populations will not be fully measured for a generation. Not only were mature, breeding animals affected, but oil drenched sargassum, which provides early nursery habitat for the most endangered sea turtle hatchlings in the world, was burned to remove oil residue from the sea. 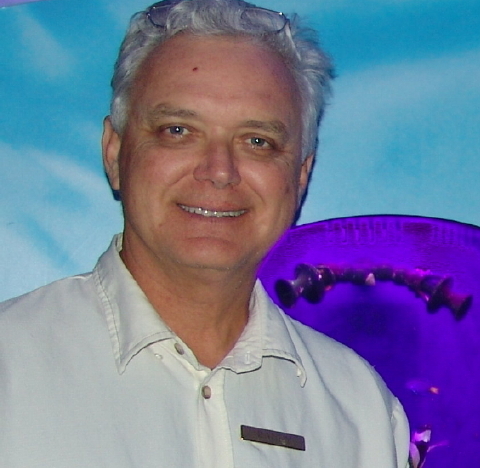 Ranger Randy (Sarton) leads the Ritz Carlton’s Nature’s Wonders, one of Turtle Journal’s favorite stops whenever we visit the Southwest Coast of Florida. Spending time in Nature’s Wonders and joining Ranger Randy for one of his many entertaining and informative programs makes a stay at the Ritz Carlton that much more pleasurable. Once the stranding season ends here on Cape Cod, and the snows begin to pile into the Northeast from massive Arctic cold fronts, you can bet that Turtle Journal will be scanning Expedia for airline tickets to Southwest Florida. 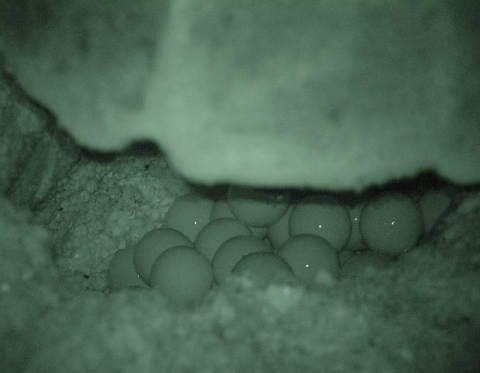 Randy reports that for the 2010 sea turtle nesting season in Collier County, they had 765 nests compared to 510 last year (2009). 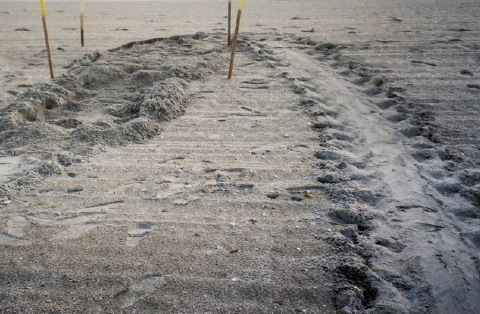 That’s a 50% increase in sea turtle nests in Collier county! 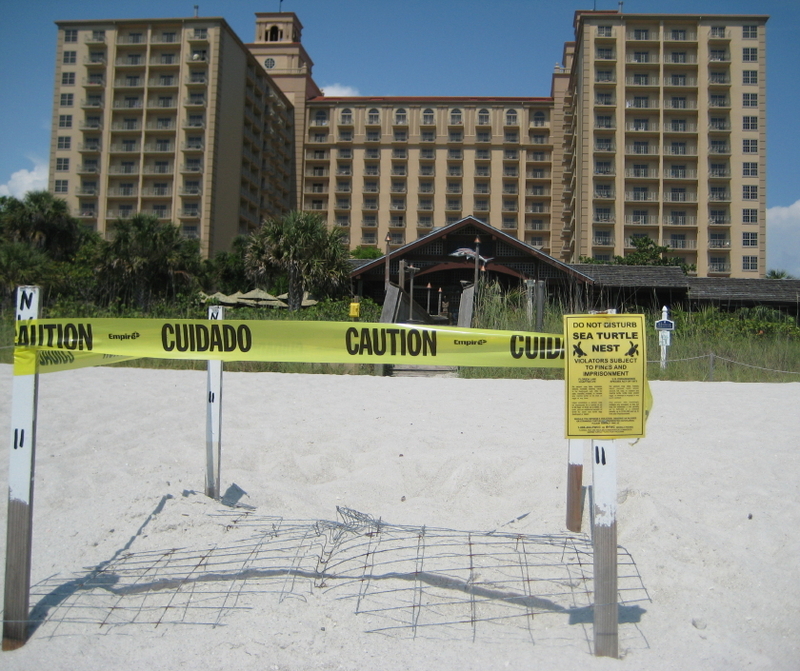 On Vanderbilt Beach, where Randy’s Ritz Carlton is located, he reports 111 sea turtle nests this year compared to only 60 last year (2009), which includes this wonderful nest pictured above directly in front of the Ritz Carlton. 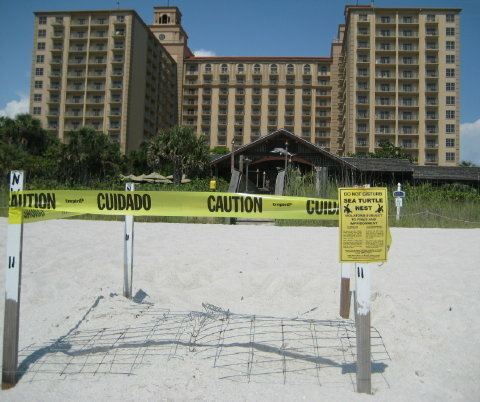 (See Loggerhead Nest at Naples Ritz-Carlton Hotel.) That’s an 85% year to year increase! In addition to the nests, Randy reports 88 false crawls (abortive nesting runs) in 2010 against only 67 discovered in 2009. The end product of all the fantastic work that the Collier County team invests in saving sea turtles is when tiny hatchlings emerge and scramble towards the brightest horizon, which is either the gulf or the closest fast food restaurant. 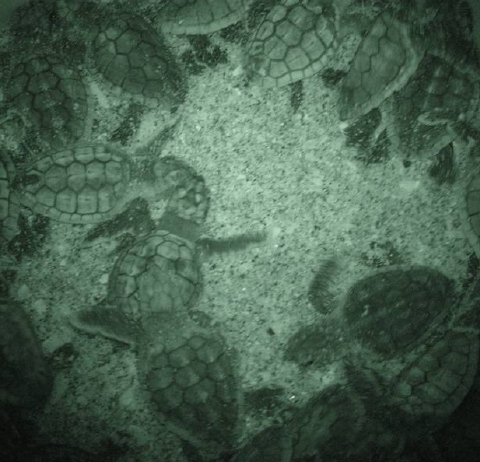 Thankfully, the Florida lights-out policy augmented by a lot of help from dedicated volunteers ensures that most of Florida’s sea turtle hatchlings catch the evening tide rather than a burger and fries. We couldn’t resist closing this post with an edited video clip from the Conservancy of SW Florida from last February. The film shows an exquisite young juvenile loggerhead in rehab at the conservancy and reminds us of what all this saving the world, one turtle at a time really means. 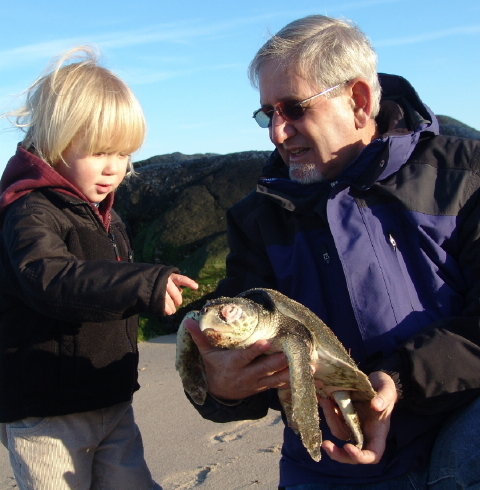 You are currently browsing the Turtle Journal blog archives for November, 2010.